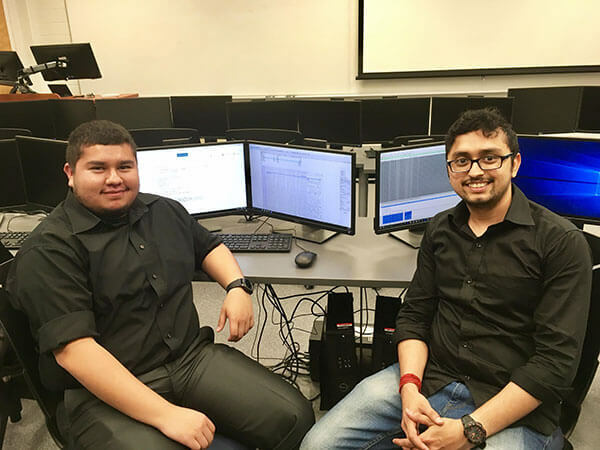 When graduate students Goutham Dhongadi Rukmasah and Erick Buenrostro completed their studies in December, they became the first graduates ever to leave St. Mary’s University with a master’s degree in Cybersecurity. Erick Buenrostro (B.S. ’16), left, and Goutham Rukmasah sit in the Cybersecurity Lab. Buenrostro, who was among the first students to enroll in the Master of Cybersecurity program in 2016, along with Rukmasah (M.S. ’17), already knew he wanted to continue his higher education at St. Mary’s after finishing his bachelor’s. For Rukmasah, who came to St. Mary’s from India, where he graduated from Anna University in 2011 and worked at IBM for four years, starting the master’s degree marked a more significant transition, living in another country and adjusting to a new way of life. Buenrostro said that not only do Cybersecurity students learn about programming logic to “improve security for computers, networks, browsers and users,” but also how information is written and stored manually, and about cybersecurity policy and law. Buenrostro also commented on the program’s faculty, which not only includes experts in cybersecurity, but also in engineering and in law enforcement. For his research project, Buenrostro built what he calls a “Mobile, Browser and Cryptography Security Package,” which he developed to target security across different platforms of the cyber field. It contains software that both protects and educates users about the dangers of the connected world. Rukmasah’s research project was a “Light Weight Security Application” — a networking and security tool with a graphical user interface that aims to simplify the work of analysts by allowing users to digitally sign confidential files, test firewalls for attacks, generate strong passwords and share files within a network. Buenrostro plans to pursue a Ph.D. in Computer Science and eventually open his own cybersecurity business in his hometown of El Paso. He said the greatest thing about a St. Mary’s education has been that it’s helping him think on his own.